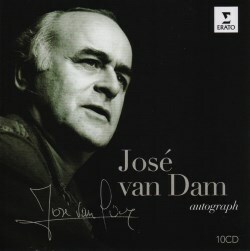 The singer known as José van Dam was born into the van Damme family in Brussels in 1940. The longevity of his career, the extraordinary versatility of his repertoire and the sheer beauty of his voice are all matters of wonder. The same goes for the consistency of his singing over fifty years of performing on the international stages as the world’s leading lyric bass-baritone. He made his professional debut in 1960 and formally retired at seventy in 2010; thus this 10 CD compilation celebrates his approaching seventy-fifth birthday in August 2015. The extracts here are drawn from some twenty-four complete opera recordings, six oratorios and songs by nine composers, eight French and one Swiss, all made for EMI over the thirty-three years spanned by these recordings. His operatic roles encompassed not only all the great French ones written by Berlioz, Gounod, Massenet, Bizet, Charpentier and Debussy but also those by Verdi, Mozart, Puccini and Wagner, in which he was outstanding. However, he never succumbed to the temptation to sing Wotan, which perhaps partially explains his vocal endurance but also demonstrates how he recognised the limitations of a large but fundamentally lyrical voice. In addition, the interview on the appendix disc reveals that he never really empathised with Wotan’s character or even properly understood his motivation, ruling him out for van Dam, as he would sing only those roles whose texts he could fully digest before learning the music. Otherwise, the range of his repertoire may be gauged from the fact that we hear him in this set singing in opera spanning over two hundred years, from Rameau to Landowski. M. van Dam’s English is not entirely fluent and he frequently defaults into French during the interview, which I found surprising given that he is clearly such a gifted linguist vocally, singing idiomatically with impeccable clarity and diction in German and Italian as well as his native French. The interview and the notes for the operatic roles are the work of Jon Tolansky, who does a good, if rather reverential, job, and irritatingly mispronounces words in three languages, such as the name of the composer Saint-Saëns and “Buoso” in Puccini’s comic opera “Gianni Schicchi”. As those notes are described as “a glance at the opera roles”, they briefly provide the dramatic context and there is nothing to help the listener appreciate the “mélodies” and the tracks from oratorios. Van Dam recorded frequently and prolifically with conductors Michel Plasson, von Karajan, Antonio Pappano and Kent Nagano and the bulk of the operatic excerpts here are from those sources. The voice itself is intensely beautiful and instantly recognisable. It is invariably completely steady, with exemplary legato and a remarkable capacity for subtly graded dynamics. It has amplitude and power and its only relative weakness is a lack of resonance in its lowest notes; otherwise its tessitura is such as to admit the successful undertaking of roles ranging from those for a basso cantante to high bass baritone. CD 1 encompasses his demonic roles and he characterises each devil differently, exploiting in particular his ability to impart a suave, sneering quality to his tone. His assumption of the four villains in Cambreling’s “Les contes d’Hoffmann” is a tour de force – and a fine contribution from Rosalind Plowright as Antonia goes uncredited. By contrast, CD 2, beginning with his patrician account of Agamemnon’s dilemma in Gluck’s “Iphigénie en Aulide”, permits us to hear the dignity, restraint and nobility of his singing in roles depicting suffering fathers, qualities also apparent in the elegant line of the Rameau’s arias opening CD 4. He even enables the listener to sympathise with that ruthless old tyrant Philip in “Don Carlos”, even if the aforementioned dryness in low notes is more apparent here by 1996. Again, it is strange that his co-singer, Eric Halvarson as the Grand Inquisitor, goes uncredited, but it is good to have the extended excerpts in French and the passage from Act IV containing the theme recycled in the “Requiem” rather than the usual cut version in Italian. The aria from “Louise” recorded in 1977 preserves his voice in finest youthful estate but comparison with recordings from the nineties also serves to illustrate how little it changed over the course of his career apart from some inevitable encroaching dryness up top. The same comparison may be made between the earliest recording here, Escamillo in 1974, with the latest, Nilakantha from “Lakmé” in 1997: there is virtually no audible deterioration in quality. Tracks from “Dialogues des Carmélites” confirm how much Poulenc owed to the example set by Debussy and demonstrate van Dam’s supremacy in the enunciation of text. Pathos is the primary quality of his various portrayals of Don Quichotte on CD 3. This was a favourite role and he chose Massenet’s version for his farewell to the stage; he inhabits it with such tenderness and devotion, especially in the famous “Sérénade” – and it was a neat idea to present for contrast both the keyboard and orchestrated versions of Ibert’s and Ravel’s songs. I especially like the provision side-by-side on CD 5 of extended tracks from the two versions of Strauss’s most notorious opera: the German “Salome” and the French “Salomé”. Van Dam is an ideal Jochanaan: young and virile, the beauty of his voice suggestive of otherworldliness amongst the decadence of Herod’s court. He is particularly moving in his narration of the events in Galilee, track 22.The French recording has been overlooked but I find Karen Huffstodt’s Salome to be remarkably good, her silvery voice being both reminiscent of Beverly Sills’ and entirely apt to depict a lascivious teenager. I wholeheartedly endorse the decision to devote a full 45 minutes to van Dam’s Golaud in “Pelléas et Mélisande”, as it is epitomises everything admirable about his vocal and acting skills; the scene where the increasingly tortured and enraged Golaud forces his little son to spy on the lovers through the high window is simply terrifying in its emotional intensity. Yet van Dam is equally adept in comedy, as he proved in his recording of “Gianni Schicchi”, while in the moving aria from Hahn’s “Ciboulette” we hear the virtues of singing simply, without artifice. Three of the remaining four discs are devoted to songs and oratorios and the last CD to the interview. I would not have said that van Dam’s dark sound was ideally suited to Berlioz’s “Nuits d’été” but he always sings so beautifully, even if a certain lightness is inevitably absent and the limitations of a piano accompaniment restrict the drawn-out languor the slower songs demand. Nonetheless, this is magisterial singing and van Dam brings such power to key moments such as “ A lasser le pied de chevaux!” in “Absence”. The “mélodies” by Saint-Saëns are undeservedly neglected and are given wonderful performances here, but all the songs by French composers allow us to relish the more nuanced and delicate side of van Dam’s art and of course his mastery of verbal inflection, while the excerpts from his recordings of liturgical music evince his more overtly demonstrative, hieratic affect. The seasoned collector who already owns most of the complete recordings from which this anthology is derived might find a 10 CD set superfluous, but I imagine that very few will have everything here. Furthermore, it is my experience that van Dam was not invariably ideally partnered – Thomas Moser’s Faust being a case in point - so some might prefer to own this compilation of his finest roles, especially at this bargain price. Michel Plasson, Herbert von Karajan, Kent Nagano, Antonio Pappano, Sylvain Cambreling, John Eliot Gardiner, Raymond Leppard, Alain Lombard, Riccardo Muti, Daniel Barenboim, Cyril Diderich, Lawrence Foster; Michel Corboz, Georges Prêtre, Julius Rudel, Jean-Philippe Collard, Dalton Baldwin, Frederica von Stade, Richard Stilwell, Ruggero Raimondi, Felicity Palmer, Patrizia Ciofi, Roberto Alagna, Margaret Marshall, Agnes Baltsa, Angela Gheorghiu, Régine Crespin, Teresa Berganza, Thomas Hampson, Natalie Dessay, Thomas Moser, Cheryl Studer, Richard Leech, Ann Murray, Neil Shicoff, Jessye Norman.